Europe’s latest weather satellite got a glimpse of the Moon before our celestial neighbour disappeared from view behind Earth on Friday. Since its launch two months ago, MSG-3 has been working well and is on its way to entering service. 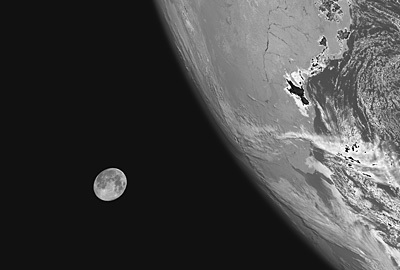 The image shows the second full Moon of the month – known as a ‘blue’ Moon – just before it disappeared from the MSG-3 satellite’s sight behind the southern hemisphere. Brazil’s eastern coast along the South Atlantic Ocean is also visible, with clouds forming over the water. The image was captured by the Spinning Enhanced Visible and Infrared Imager (SEVIRI) instrument at 11:20 GMT. The imager scans Earth’s surface and atmosphere every 15 minutes in 12 different wavelengths to track cloud development and measure temperatures. Launched on 5 July, the third Meteosat Second Generation satellite is in a six-month commissioning phase by Eumetsat, the European Organisation for Exploitation of Meteorological Satellites. This includes checking that the imaging service works fully and delivers high-quality products for weather forecasting. ESA developed the satellite in close cooperation with Eumetsat, and was responsible for initial operations after launch. It was then handed over to Eumetsat on 16 July. The first satellite in the series, MSG-1 – also known as Meteosat-8 – was launched in 2002. MSG-2 followed three years later. Both have continued the legacy of the operational meteorological satellites that started with Meteosat-1 in 1977. The MSGs offer more spectral channels and are sensing Earth more frequently and at a higher resolution than their predecessors.